It's been another long gap between postings. I've been swamped finishing up some books and revisions. I've finally finished most of that work, but soon we'll be heading into the last weeks of the semester. 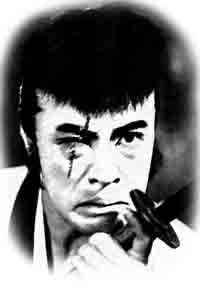 I was sad to see the news on the Mainichi site that the actor Ogata Ken died on the 6th at the age of 71. The cause of death has not been released, but he apparently attended a press conference for a new TV series on the 30th and only recently fell ill.
Ogata was one of the most impressive actors from the 1970s on, something that may have come from the fact that he started out in Shinkokugeki (a more realistic form of swordplay theater founded in 1917 by Sawada Shojiro in the 1920s; the same acting troupe that gave birth to Okochi Denjiro, one of my other favorite actors). Ogata made his film debut in 1960, but did not really make an impact until the 1970s with Imamura Shohei films like Vengeance Is Mine and Narayama Bushiko. He was firmly established as one of the top film and TV actors, appearing in controversial films like Paul Schrader's Mishima (as Mishima), big budget spectaculars like Sato Jun'ya's Oroshiyakoku suimudan, and even action flicks like Ishii Takashi's Gonin 2. His physical presence, unique voice, and original character (shown off most when he wore sunglasses) made an impression in anything he appeared in. Both his eldest son, Kenta, and his second son, Naoto, are actors.